Kavita Seth rose to fame with his playback Sufi Singing at Indian Cinema. Sufi Music has always been an established genre within Bollywood, which includes Qawwalis, Naat and Arfana Kalam. 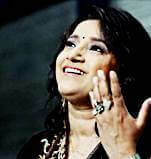 Kavita established herself in such genre and won several awards for many songs. She is known as one of most famed Sufi Artists in India.